Poised on our bikes at the edge of a field, we tried hard to see the future in the semi-deserted parking lots of the Alfa Romeo car factory, cracked by the roots and the sun of too many summers. Surrounded by the hum of the road tumor, the beast of concrete and chimneys slept, necrotic, like the cement carcass of a prehistoric mammoth.I was almost ten and our fourth year of elementary school was coming to an end. Peo raised an eyebrow and looked at Flavio, who sighed and uttered an unconvinced, “Yeah…maybe…” that seemed to come from a very distant planet. The factory, once a bustling hive of activity, seemed to have run aground in a sea of empty parking lots claimed by shrubs and brambles. Nico said, “It’s not the end of the world, you know? Jobs come and go. Maybe you’ll move to Sicily,” he joked with a hint of bitterness. Somehow he had started hanging out with us more and more, at times almost forgetting to enact his tough kid part. I looked away from the forgotten parking lots, searching for comfort in the dark eyes of Peo, faithful, old friend. I found him already staring at me, the funeral gaze in his face reflecting my mood like a mirror. 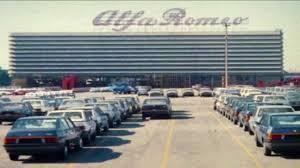 Alfa Romeo is an Italian car manufacturer that was owned by the Italian state from 1933 till 1986. The Arese plant was inaugurated in 1963 and reached the apex of its activity in the 70s and 80s, when it counted 22,400 employees (the town was around 16,000 people at the time). The company started declining in the 80s, laying off employees and resizing to 16,000 up until 1986, when Alfa Romeo was sold to a private company, FIAT. People were laid off in big chunks, causing strikes and protests and leading to the progressive decay and abandonment of the site. 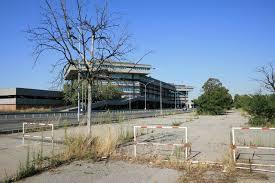 The situation did not improve and eventually the plant closed in 2005. Since then, the site has been refurbished and a beautiful Museum has been erected to remember the plant that drove the history of this little town in the north of Italy.